Win chance metal co., Ltd is a professional manufacturer of Ratchet Buckle and Hooks. Our main products include Wire Form Part, Stamped, Pressed Part, Safety Product Hardware, Carabiner, etc. In addition, we also provide Forging Parts, S Hook, J Hook, Eye Snap Hook and Extendable Ratchet Buckle with superior quality and competitive price. 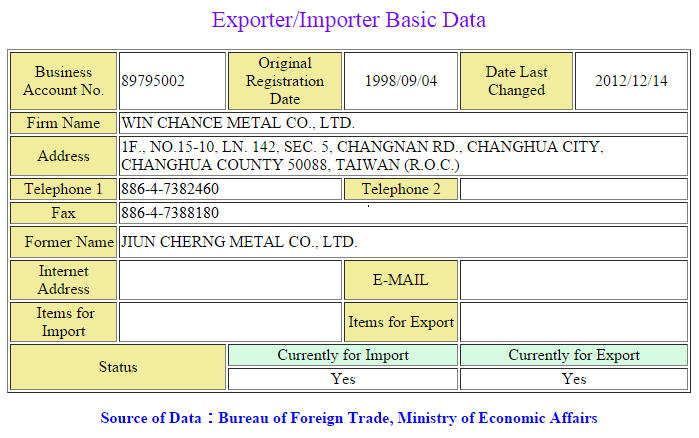 Win Chance Metal Co., Ltd. is a manufacturer of metal hardware with more than 20 years of professional experiences. The main objective is to provide customers with a superior quality and outstanding competitive prices. The team is extremely attentive to customer needs. Win Chance always supported with a totally satisfactory and guarantee services. We utilizes advanced wire forming, precision punching, thread rolling machine, along with accurate jig to correspond to the production. It has the ability to satisfied small quantities and also batched up with larger production capacity. In the most recent years, Win Chance had been inno-vatively creating on raw product material, such as Wire-form parts, Machined hardware parts, Stamped & pressed parts, Forgings, Ratchet Buckle, Cam Buckle and Ratchet tie down. We are also the manufacturers of special bolts, nuts and fasteners. Win Chance expects "Exceptional quality, outstanding pricing, short lead time and accurate delivery" as our motto for business success. We also strive to upgrade R&D competence and better manufacturing technology. It is aiming with the perspective of globalization and making Win Chance a true diversified international business. We proud of our ability to sustain outstanding professional manufacturing service thoroughly with business alliances and partnerships. At Win Chance, we have superior resources to design and manufacturing the metal hardware that will meet your requirements. Win Chance has wide range variety of product choices; we let you as a customer to make the picking. Win Chance has a technology oriented R&D department to research and developing new product line to convene customer demands. Our R&D team specifically with the design and deliver to the product technology conceptual philosophy. Our engineers knows how material stress strains and its mechanical properties. Our in house tooling design capability enables us to set the right tune for our die thus create extemporary product group.